Vers has announced a new line of hand-crafted wood cases for the iPhone and iPod, that are made from walnut, cherry, and bamboo wood. Each case features a soft, scratch-resistant lining, steel pin reinforced corners for added strength, a durable UV and moisture-resistant clear coat, a “quick-eject” rear finger hole, and a front oval hole on the iPhone cases designed to allow for visibility of the time while still in the case. "We've had a very enthusiastic response from our customers to both our Vers 2X and Vers 1.5R wood sound systems. Wood cases are a natural next step. Wood is a wonderful feeling, natural material and every case has its own unique character. The real surprise is just how tough wood is, particularly Bamboo; it far exceeds that of any plastic. It looks great, offers superior protection and is the most renewable resource on the planet -- you can't ask for more," says David Laituri, product designer and co-founder of Vers. 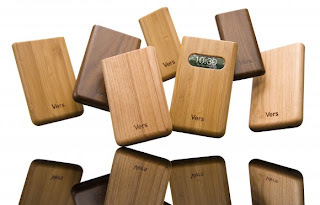 Vers wood cases for iPhone, iPod touch and iPod classic are MSRP $39.99 and $34.99 for iPod nano. All four models are available on the market now.